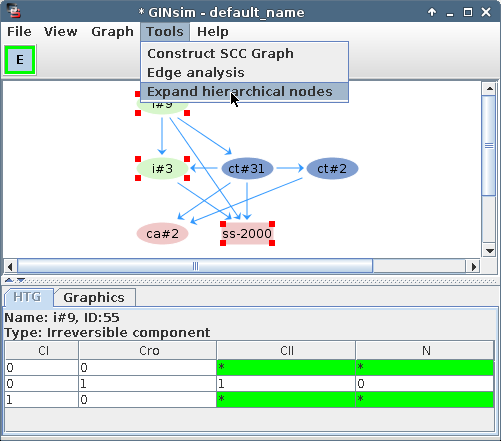 Starting from the Hierarchical Transition Graph (HTG) it is possible to generate the underlying STG. The generated STG will contain all the states and edges corresponding to the set of selected hierarchical nodes. The computed STG can also be extended to the states in the immediate neighborhood of the states of the selected hierarchical nodes. Once the HTG is generated, it's possible to select the set of HTG nodes to be expanded, using the mouse together with the Ctrl (Cmd on Mac OS X) key pressed. After the selection of nodes, the HTG expansion tool can be launched through the Expand hierarchical nodes option of the Tools menu. Selection of HTG nodes to be expanded in the corresponding STG. Dialog used to run the STG extraction tool. This dialog presents an option to include the states in the immediate neighborhood of the selected states, and another for the definition/selection of perturbations to the model. The option to define and/or select a perturbation to be applied to the model, which will affect transitions between states in the STG.